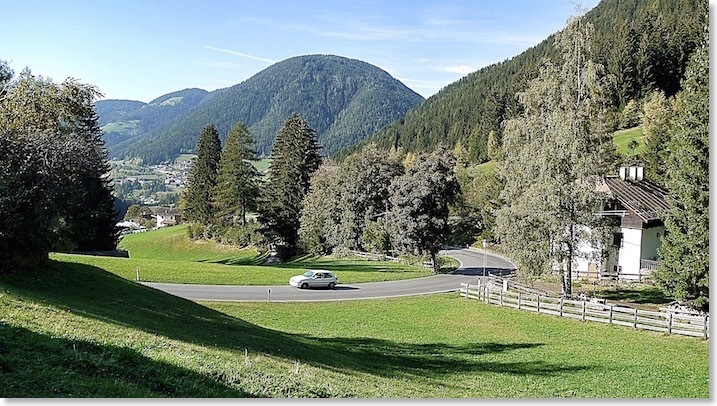 “Nova Italiana” is not a name you will find on any modern map covering the early kilometres of the Great Dolomite Road. 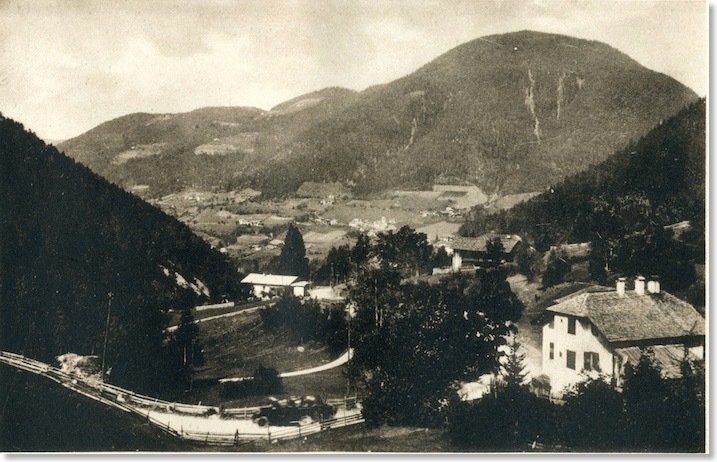 Neither is it referenced in the ultra-detailed Baedecker’s Austria-Hungary guide of 1905 that I own, although there is a clear reason for that: at that time, this area, a southern outpost of the Tyrol, was still part of the Austro-Hungarian Empire, and not part if Italy at all. The area was ceded to Italy by the post-War Treaty of St Germain-en-Laye in 1919 and formally annexed by Italy that same year. Given that 1919 would be close to the date that the Zardini photograph was taken, this was indeed part of “Nova Italiana”, the “new Italy”. I also like to think that the smart new car speeding up the road in the photo was seen by the photographer as a symbol of that Italy, then as now! The photo appears in both versions of the Zardini guide to the Road. Finding the same spot today, a series of steep bends about two kilometres uphill from Welschnofen (a village which still retains its dual name of Nova Levante, by the way) was straightforward. New building by the roadside (behind me) prevented access to the exact spot from which the Zardini photo was taken, but I was able to get within perhaps 10 metres of it. I probably did not have to wait as long as Zardini for a car to pass, though! Note that the building in the right foreground is essentially unchanged.